I’m not sure if there are any “rules” to blogging, but if there are, I imagine that “don’t direct traffic away from your blog” is probably right up there with “don’t infringe on copyright law” and “try not to kill anybody” on the blog-fascists’ decree of dos and don’ts. But I’m a contrary little bugger, and I’ve always liked to fly in the face of prescriptivism: imagined or otherwise. So I’m going to dedicate this entire article to someone else’s website. Prepare yourself for a blog post of unashamed nepotism and brazen preferential treatment. My friend Thom has recently embarked upon a reading project of vast size; a veritable Goliath next to the David that was my Booker Prize Challenge. 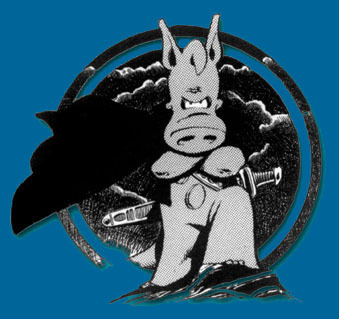 Thom has set himself the daunting task of reading and reviewing the entire twenty-seven-year run of Cerebus, an independent comic by Dave Sim. That’s 300 issues; 6,000 pages. Luckily for Thom, these issues have been re-printed in 16 omnibus volumes; which should make things much easier – each averaging a mere 375 pages of densely layered, transcendental literary and graphical satire. Thom’s target is to read (and blog about) one volume a month – thus extending this project over a 16 month period (concluding in Jan/Feb 2012). As you can imagine, this will require enormous reserves of dedication, readerly stamina and perhaps even a foolhardy abandonment of loved ones; such is the scale of the task ahead. On second thoughts, maybe this challenge isn’t just daunting; it’s probably terrifying and almost certainly dangerous. Hell, it’s downright irresponsible. With this in mind, I urge all of you to support Thom in his endeavour, as he blurs the boundaries of the consumer and the critic, the reader and the reporter. The first month’s review is already live, and I heartily recommend you read it immediately. It’s wonderfully well-written, and stylised with Thom’s characteristic extensive vocabulary, charmingly self-deprecating wit and constantly insightful moments of discerning and informed observation. Once you’re done, I further recommend that you take some time to browse the archives of Thom’s blog. There’s a beautiful essay on the tenets of depression, a poem about staring into the sun, and something long and confusing with ‘Bastardisation’ in the title. This entry was posted in Uncategorized and tagged Cerebus, Dave Sim, Postmodern Idiosyncrasies. Bookmark the permalink. I bet the bloggeratti have no such compunctions towards killing. Other than that I’m not sure what to say. Other than that I am touched… hopefully appropriately… and that I shall only abandon the loved ones it isn’t foolhardy to abandon.